Let the new season of collecting begin! 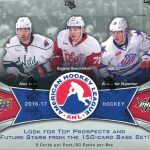 The 2017-18 hockey season is still a month away, yet Upper Deck likes to get the “collecting season” started early. 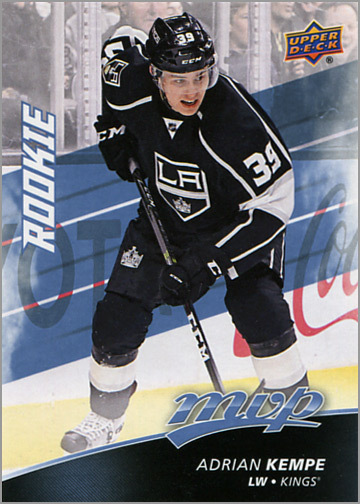 Coming out almost two months before the start of the season is Upper Deck MVP Hockey. 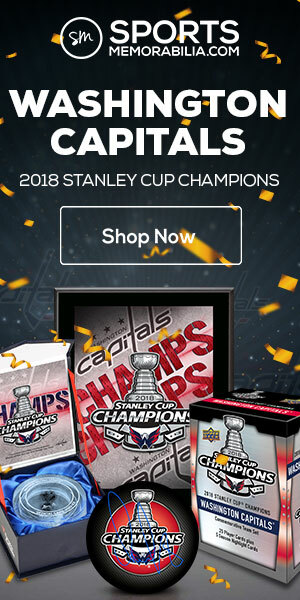 Although the price is the same as last year’s MVP — about $3 USD per pack or $40 USD for a 20-pack box — the set is smaller, with over 100 less short-printed cards, making this year’s offering easier to complete. 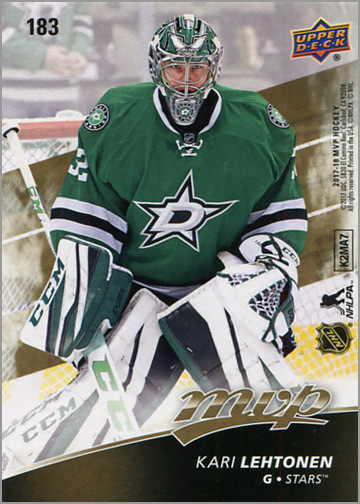 The 2017-18 Upper Deck MVP Hockey card set consists of 200 base cards and 50 short-printed cards for a total of 250 cards. This is smaller than last season’s set, which was 360 cards total (200 base cards and 160 short prints). That means that this year’s set is easier to put together. 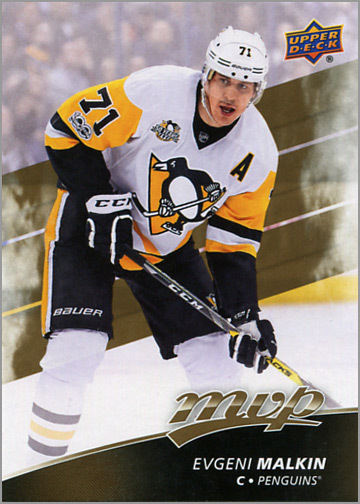 The front of each card uses the typical MVP design: a cut-out player in front of a ghosted background, with some sort of design element encroaching on the photograph; in this case, three diagonal lines. Also typical are the card backs, which show only the past five years of statistics. Worth noting is that my box did not have any doubles, which is good because getting doubles in a box is disappointing when the set size is larger than the amount of cards you get in one box. The one downside to this year’s MVP set is that 30 of the best — not necessarily the 30 best — NHL players are short printed. 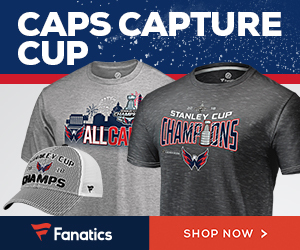 (Evgeni Malkin is not a short-print, but Johnny Gaudreau is?) 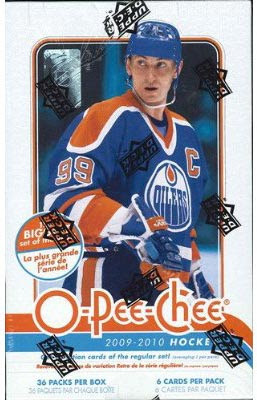 I have grown to accept that practice for rookie cards, or maybe legends, because they are not essential for a set of hockey cards. 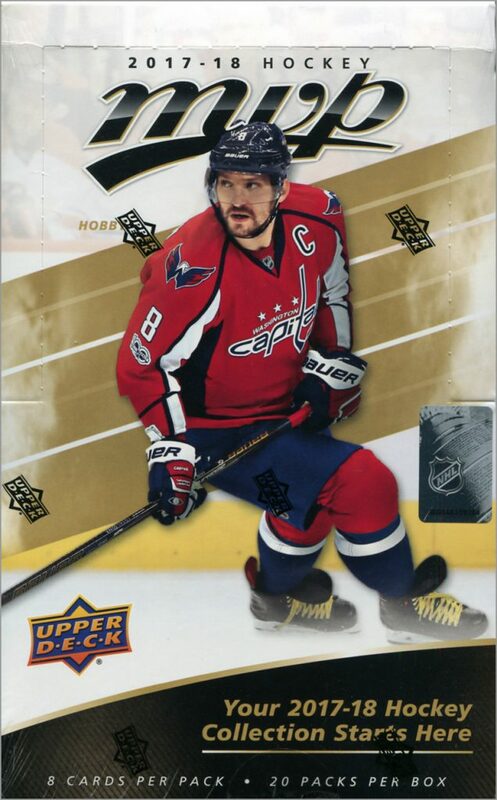 But making players like Sidney Crosby, Connor McDavid and Alexander Ovechkin — he’s on the freakin’ box! — harder to get just to make the set more challenging to collect is total weak sauce. 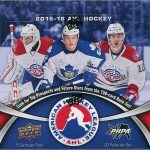 My box had four rookie cards — “leftovers” from the previous season, who made their NHL debut after the 2017 NHL All-Star Game. In total, I got 10 short-prints. Hobby boxes yield one short print in every two packs, while retail packs yield short prints in in every four packs. So, while these packs may be cheaper at Target or Wal-Mart, you’ll have to buy more packs to finish your set. This was an idea that Upper Deck debuted last year, and I liked it. Nine “Puzzle back variants” combine to form Voltron a giant hockey card. There parallel the 200-card base set, though I am not sure that the two checklist cards (100 and 200) actually factor into the puzzles, since each one is made up of nine cards. 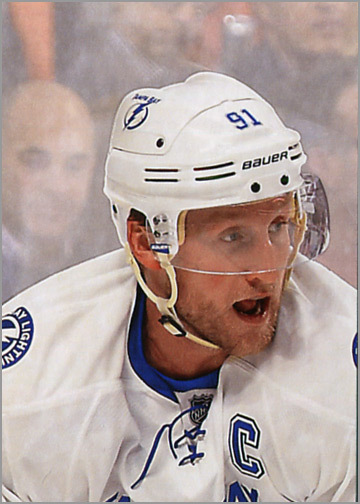 Puzzle back variants, at first glance, almost look like base cards, except they are more cluttered, with the NHL and NHLPA logos, copyright text, card number, and such. Because they almost look like base cards, I have found last year’s MVP Puzzle Back Parallels in dime boxes at card shows, mixed in with base cards. Either the dealers did not know these were parallels, or they did not care. It wouldn’t be an MVP set without Silver Scripts parallels, right? This year, Upper Deck added a black stripe behind the facsimile autograph, making it easier to read — as if you could actually read any current player’s chickenscratch autograph. Upper Deck sure loves to make the same card five times. There are blue, gold and purple “Colors and Contours” parallel versions of all 250 cards. These parallel cards are shiny, use embossed ink for the MVP logo and player’s (facsimile) autograph, are die-cut and have a texture to them. 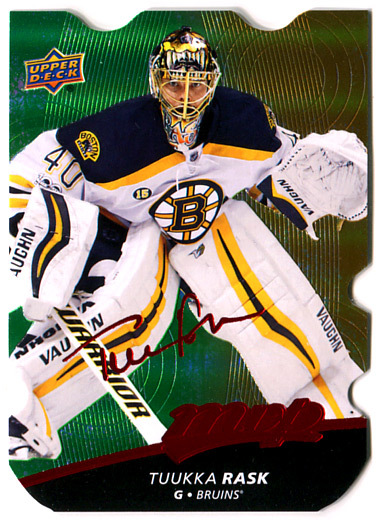 If Upper Deck could also somehow fit in a hologram on these cards, and then serial-number them, they’d use every gimmick on the list. Now THIS is cool. 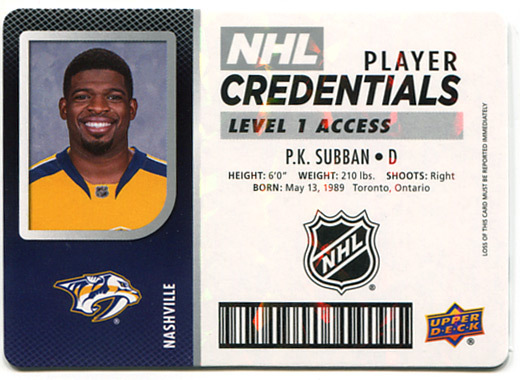 NHL Player Credentials look like an employee ID of someone who works for a government agency at a high-rise building, and would need to scan this card to take the elevator to the 58th floor. The back has a fake magnetic stripe; perhaps to make purchases in the employee cafeteria? Or something like that. These cards use rounded corners and have a slightly prismatic background on the white area of the card. 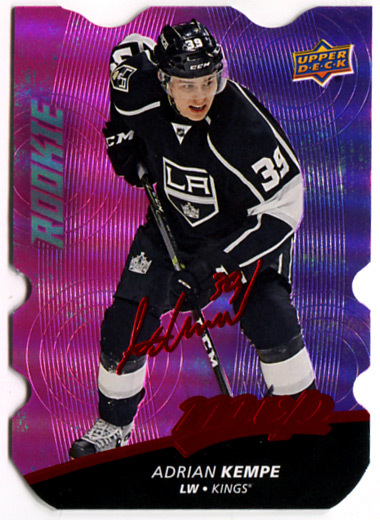 Three of the NHL Player Credentials I pulled were “Level 1 Access,” which use silver ink on the front. I also got one “Level 2 Access” parallel, which uses gold ink instead. 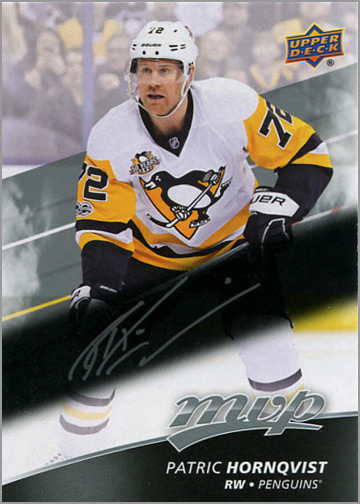 What I like about 2017-18 Upper Deck MVP: Base card design looks nice. With only 50 short-prints this season, it is easier to build a 250-card set than last season’s 360-card set. Puzzle Back Parallel Variants make a return! NHL Player Credentials are creative and fun. The signatures on the Silver Scripts parallel cards are easier to read. 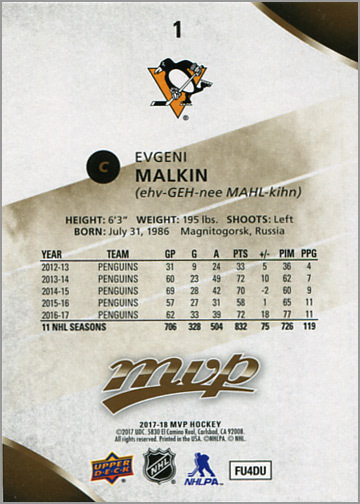 What I do not like about 2017-18 Upper Deck MVP: Short-printing the best (or best-ish) 30 players is lame, since cards of these players will be readily available as non-short printed base cards in Upper Deck Series One/Two, O-Pee-Chee, Ice, Black Diamond, etc. The 20 rookies in this year’s MVP set are, for the most part, not very exciting. 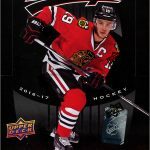 Oh, and there is a chance to pull Rookie Redemption cards for players who will debut in the 2017-18 season, but the odds aren’t favorable: between 1:250 to 1:400 hobby packs. Upper Deck MVP is a marked improvement over last year’s offering, which got ridiculous with its different tiers of short-prints. This year’s set is an almost back-to-basics approach: 200 base cards and 50 short prints found 1:2 hobby packs (1:4 retail packs). So, this set isn’t too hard to complete, and has a pair of fun inserts with Puzzle Back variants and NHL Player Credentials. With two boxes, you could probably finish a base set. 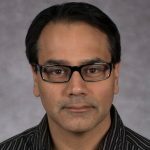 I agree, you can short print rookies but not the star players. Topps does this with its Baseball Heritage set. It stinks. Yeah, what’s the point of collecting a set of sports trading cards if you can’t get the best players?